Mental health issues affect millions of Americans every year. According to Bradley University’s infographic Mental Health in America, 18.1% of adults in the United States experienced mental health challenges in 2014 alone. Workplaces might wonder, how is that their problem? Why should they be concerned about the employee mental health issues that they are dealing with in their free time? The fallout of mental health challenges, unfortunately, is not confined to an employee’s personal time. A dip in employee productivity. Loss of employee (for a variety of reasons) and the need to begin the expensive rehiring process. Due to the effect, mental health issues have on employee’s professional lives, businesses should consider implementing few tactics to encourage employees to remain in good mental health in the workplace. 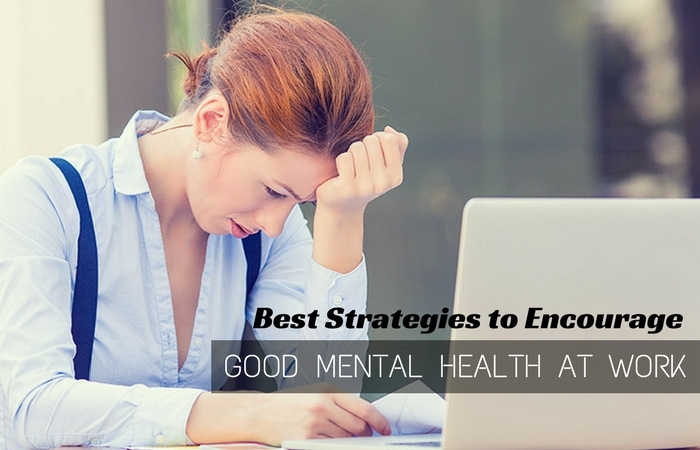 Check out 9 potential tactics you can utilise to potentially safeguard your employees and businesses from the fallout of lingering mental health issues in the workplace. An easy, investment is to provide health insurance that has good policies to help employees who need mental health treatment. The sooner the worker’s health improves, the sooner the he or she will return to peak productivity. Individuals who have insurance are 25.2% more likely to seek treatment. If you can afford to invest in insurance for your employees, it can be a stellar investment on this front alone. PTO can aid employees who need to either take off work to see a doctor or simply a mental health day to re-calibrate their brain. If an employee needs the day off to solve mental health productivity problems, it’s in the company’s interest to give them that option. The fact that the employee might not be able to afford it, could prevent employees from taking that time off and solving their issues in a timely manner. Studies have found, exercise can be an effective way to relieve and ward off depression. Office workers especially are sedentary creatures that often don’t exercise as much as they should. Partially or fully funding employee’s gym memberships could decrease the chances of productivity loss due to stress or depression. The membership will encourage employees to create a regular exercise routine. Be flexible with employees who experience anxiety, high levels of stress, or depression. Give managers and human resources the power to allow mental health days. Consider taking the flexibility a step further by allowing human resources to work with the employee to create a work schedule and environment that will work for them. If the employee cannot work effectively due to high stress or anxiety created by the work environment, consider allowing the employee to work where they feel the most productive until they have worked with a psychologist to learn anxiety and stress coping techniques. Once they have their anxiety or stress under control, you can re-integrate them into the normal work force. It’s best if HR and management don’t shrug off reports of workplace bullying. The phrase, sticks and stones can break my bones, but words will never hurt me, isn’t actually true. Physically and verbal bullying can do short-term and long-term harm. Workplace bullying and depression are unfortunately linked. According to Medical Daily, 49% of people who have been bullied reported a diagnosis of depression. If left unchecked, the bullying and the mental health fallout for the workplace could easily lead to high turnover, low productivity, and lost innovation. HR should take reports of bullying seriously. HR should investigate any reports of bullying promptly. They should interview the individual who reported the incident, talk to witnesses, obtain any evidence, and once the information has been collected decide if disciplinary action is required. If no disciplinary action is required, you might want to at least attempt to move the affected employee to a new location where they will interact less with the individual who allegedly bullied them. Humans aren’t robots. We need the occasional moment of casual conversation to maintain good mental health and ward off stress. Beyond the stress relief that friendships can allow, individuals who have friends at work are more likely to love the company they work for. That can increase employee retention or encourage past employees to remember the company fondly. Don’t expect employees to always remain on duty (even when technically off duty). The internet and smartphones has made it possible for employers to demand that employees always be available to answer questions and take calls outside of the official work day. Employees need that time to recoup from the stress of the work day. Expecting employees to always answer emails (even after work hours) leads to extended periods of increased stress. The fallout from stress related mental and physical health issues can outweigh the benefit from immediate answers to emails from management. If the workforce feels unduly stress (not all stress can be eliminated from any job), consider having HR, managers, or an outside agency teach employees stress relief techniques. The better-equipped employees are to handle stress, the healthier they will be. If employees need to take a few moments every once in awhile to utilise any of the techniques, management should allow them that time. (As long as it’s reasonable and leads to increased productivity after). Business productivity is dependent on the productivity of employees. Employee’s productivity, unlike robots or machinery, is highly dependent on their positive mental health and work. Stress, anxiety, or depression in the workplace can all lead to dips in productivity, innovation, and attendance. That can affect the company’s financial success. Companies should try to adopt policies that create an environment that doesn’t lead to an increase in employee stress, anxiety, and depression. And they might consider implementing perks that prevent and alleviate mental health issues. Your company and your employees will thank you.